Playing piano may have been a privilege for the well-off aristocrats in the past, but nowadays it is a completely different story. You still need the instrument, of course, but it is a lot easier to find a good mentor who will show you the ropes, even a virtual one! The internet offers a vast number of opportunities and learning how to play the piano is no exception. All you need is some free time and a willingness to learn! A piano is an acoustic stringed instrument which produces sound when the strings get struck by hammers. The player activates the hammers by pressings keys on a keyboard. The harder the pressure, the louder the sound. But, it wasn’t always like that. The history of this instrument dates back to the Middle Ages, when the first string instruments, hammered dulcimers, started being used in Europe. However, people wanted something different: a string instrument with a keyboard. There were a lot of attempts to achieve this, and as a result, they had a clavichord (strings were struck by tangents) and a harpsichord (strings were plucked by raven quills). Even though all of the innovations were impressive, it still wasn’t enough. 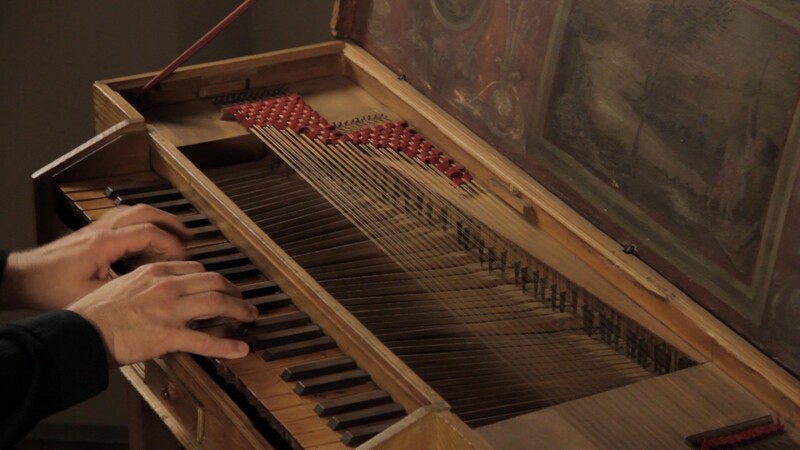 Harpsichord didn’t have the control over the dynamics (loudness or softness) of every tone and clavichord sounded too delicately and would often be overpowered by the sound of other instruments. The maestros wanted to be able to control the sound volume. That’s when Bartolomeo Cristofori from Padua, Italy came into the picture. He was hired by Ferdinando de’ Medici, Grand Prince of Tuscany, to be his Keeper of the Instruments. The exact year when the piano was made cannot be precisely identified, but it is known that the Medici family had a piano in their possession by the year of 1700. Some sources state that the year of the invention was 1698, but their credibility is doubtful. The only three Cristofori’s pianos that survived until today are from the 1720’s. The original Cristofori piano looked quite different from the modern one. Its keyboard had the opposite color pattern: The natural keys were black and the accidentals were white. This was changed by Sebastian LeBlanc. The original instrument Cristofori invented had been named the pianoforte (or in Italian: clavicembalo col piano e forte, meaning harpsichord that can play normally and more strongly). The word piano became more widespread only in 1732 when the pianoforte was shortened. Not all pianos have the same number of keys on their keyboard. The most common number of keys is 88, that is 52 white keys (the naturals) and 36 black keys (the accidentals). The majority of the older pianos were somewhat smaller than the modern ones, so they had only 85 keys. However, some manufacturers produce pianos with a number of extra keys. For example, the Imperial Bösendorfer has nine additional keys that range over the whole 8 octaves. Their pianos often have a lid that can cover the extra keys if the pianist isn’t used to playing on a piano like that, or the keys can be of different color. Another manufacturer, Stuart and Sons made a piano with 102 keys. Here, the extra keys are not different from the regular ones visually. The number of keys can head in the other direction, as well. Piano manufacturer Schoenhut specializes in producing toy pianos with 44 or 49 keys. 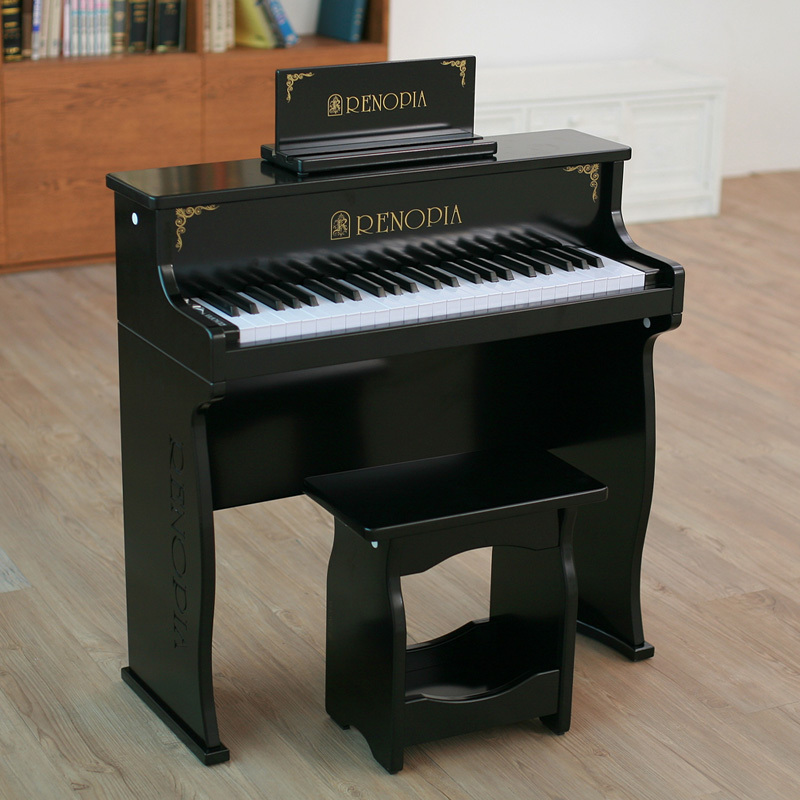 This version of piano is very popular with aspiring pianists who want to enjoy all the perks of having this instrument at home, but don’t have enough space for the larger versions. Another version of this instrument worth mentioning is Emánuel Moór Pianoforte. The main difference between this version and classical versions of a piano is the fact it has double keyboards. The inventor of this interesting instrument was Emánuel Moór (1863 – 1931), a Hungarian composer and pianist. It was made with two keyboards, one above the other. Usually, the lower one had the regular 88 keys, and the upper one was slightly smaller, containing just 76 keys. Playing it was also very unusual. 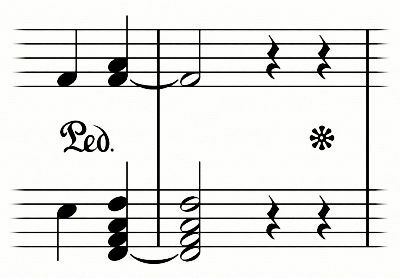 Namely, when a key on the upper was pressed, the mechanism within the instrument would play the matching key on the lower keyboard, just an octave higher. This mechanism proved to be an advantage because it allowed the pianist to reach two octaves with one hand which couldn’t be achieved when playing the regular piano. It made playing complex pieces (originally composed for double manual harpsichord) doable, since playing them on a single keyboard piano would require extremely difficult, cross hand movements. The Emánuel Moór Pianoforte was never mass-produced. A few piano manufacturers (mostly Bösendorfer, but also Bechstein, Chickering, and Steinway & Sons) have made only about 60 instruments ever. If you want to master playing piano, you also need to know where to find each note. Let’s try to learn that on a classic 88 key piano. The first note on every piano keyboard (no matter how many keys it has) is C. It is also a rule that it comes just before the two black keys. Depending on the size of your piano, you will find quite a number of Cs. If you go eight keys up from the initial C note, you will find another C. The eight notes make an octave and as we already learned, the most common 88 keys piano has seven octaves plus a minor third, from A0 to C8. An 88 keys piano also has a middle C key. If you are sitting at the center of your piano properly, you should find it just below your chin. The Middle C fits right in between the bass clef (left hand) and the treble clef (right hand). Now, it is time for the other notes! 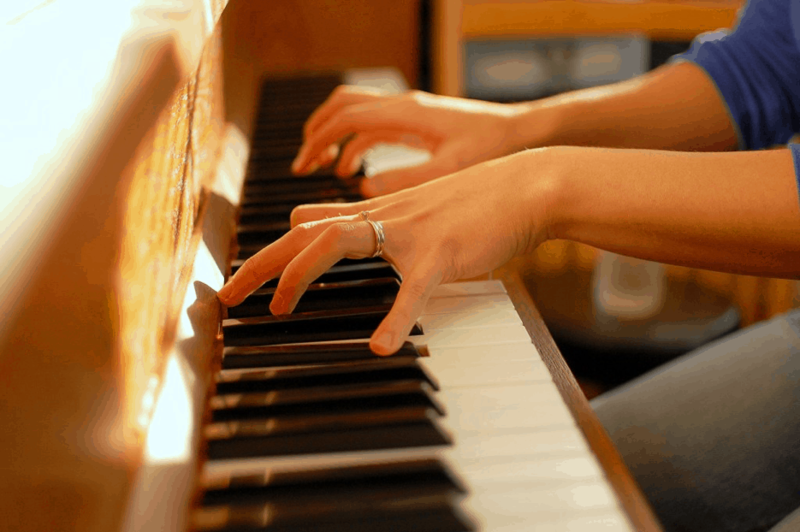 When it comes to piano, the notes are named by the first seven letters of the alphabet (A, B, C, D, E, F, G). Since the first note on every piano is C, the next one on the right is D, then comes E, F follows, and the last one is, naturally G. After G, you return to the beginning of the alphabet and our notes, so the following note is A, and then B. The white notes (C, D, E, F, G, A, B) are called naturals, and a sequence C, D, E, F, G, A, B, C makes an octave. Now that we mastered the white ones, we can move on to the black notes. They are called accidentals and are also named after the first seven letters of the alphabet. The difference between naturals and accidentals is that accidentals can be sharp or flat. Sharp is when you go higher, that is when you move to the right on the keyboard, while flat means just the opposite: you go lower or move to the left of the piano keyboard. Now, let’s think about naming our accidentals. The first black key to the right of C is C sharp (C#). This key has an alternative name: D flat (Db) because it is found on the right of D key. The next accidental is D sharp (D#) or E flat (Eb). F sharp (F#) or G flat (Gb) follows, then we have G sharp (G#) or A flat (Ab), and finally A sharp (A#) or B flat (Bb). The same as with naturals, the pattern is repetitive, so after B flat, there comes C sharp, the first black key we mentioned. Aside from the two sets of keys, pianos also have pedals. Usually, there are two pedals: the una corda and the sustain pedal. But, the American grand piano also has the third pedal called the sostenuto pedal. The una corda pedal is found on the left, so the pianist uses their left foot to activate it. It can also be found by the name of the soft pedal or the piano pedal. Like the name suggests, it makes the sound softer. It alters the notes that are already soft and does not have the optimal effect when used with louder notes. The mechanism behind this pedal and its effect can also be guessed by translating the name of the pedal. Una corda is the Italian phrase for “one string”. So basically, when pressed it prevents the hammer from hitting all three strings attached to keys, it only strikes one of them. 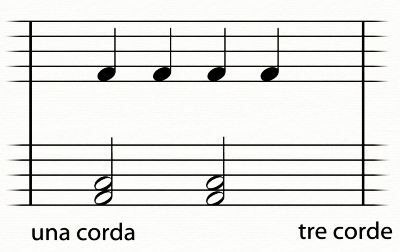 It is marked by the words una corda for the beginning and tre corde (three strings) for the end of the pedal use. 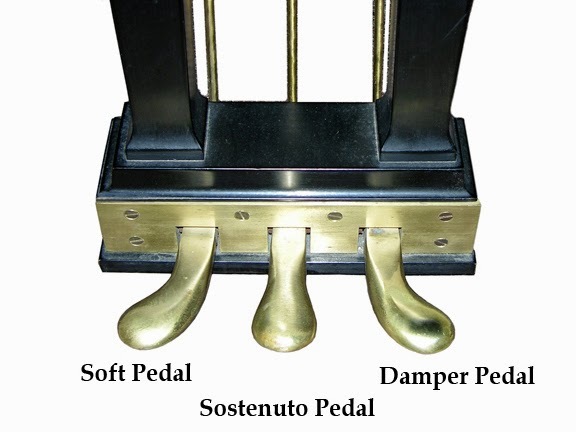 The sostenuto pedal is the middle pedal, but it is quite common for it to be left out. The pianist activates it with his or her right foot. It is used to sustain some notes, while the others remain unchanged. The selected notes will resonate until the pianist releases the pedal. This creates a staccato effect as the selected notes can be heard alongside the ones played after. Although it is rare for European composers, Claude Debussy often included it in his pieces. The beginning of the use of this pedal is marked with Sost. Ped. and the end with a large asterisk. 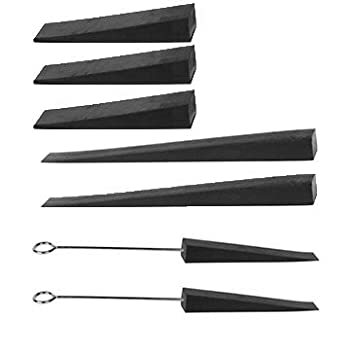 The sustain pedal is the one on the far right and pianists use it with their right foot. It is also commonly called the damper pedal, forte pedal, or the loud pedal. It enables the notes to resonate as long as it is pressed. This makes the notes echo and overlap. The sustain pedal wasn’t always operated by foot. Initially, it was activated by hand and the pianist had to have an assistant who would press it when necessary. Later, they modified it into a knee lever and finally, it became the pedal it is today. In piano notes, it is marked with Ped. for the beginning, and a large asterisk for the end of using this pedal. Your piano has to be tuned. Professionals claim that this process is quite simple when it comes to the mechanical part, but it always takes time to master it, and, of course, you need special tools. If you decide for the “do it yourself” version, the required tools will actually cost you less than a visit from a professional tuner. Three most commonly used tools are tuning levers, electronic chromatic tuner, and mutes. The piano tuning lever is designed to fit the piano pins. It is imperative for it to have a firm handle and to fit the pins impeccably. Although you can purchase one for less than $20, it is widely remarked that the more expensive the tool is, the better it performs. 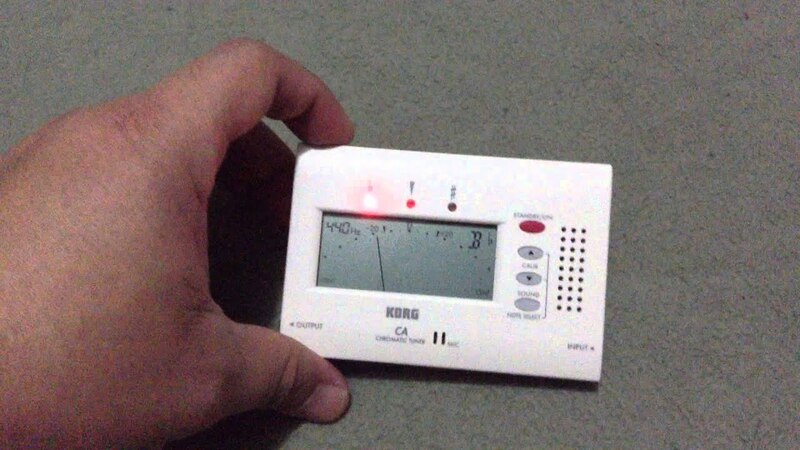 Electronic Chromatic Tuner is a very useful tool, especially if you are not that experienced. It provides the reference for each note of the octave, that is, to tell you if they sound the way they should. Now that you have all the tools, here comes the difficult part! First, make sure that the room is as quiet as possible. Pay special attention to the objects that can produce humming sounds. The octave you should always start with is middle C. As you certainly remember, each key is usually connected with three strings. Focus on the middle one first. Find the pin connected with the string you are working on and place the lever on it. Place the rubber mutes on the other two strings to prevent them from vibrating. Do your best not to be too rough, so as not to damage the wire. As you are firmly striking the key, start turning the pin with the lever clockwise very gently and slowly until your electronic chromatic tuner says it is in tune. You are done with the middle string. Congratulations! Move the mutes from the string you’ve just finished tuning, so that only the last string has the mute on. When it comes to the left and right string, you shouldn’t rely on the chromatic tuner. Listen carefully and do it by ear. Again, turn the pin clockwise while striking the key until it sounds like one note and not two in disharmony. Repeat the process for the third string with all mutes removed. Use this method for all the keys that need tuning. However, if all of this sounds too complicated, you can always hire a professional tuner. They usually charge by the hour and it will take them about one to two hours on average. The cost varies, but it is usually around $150 per hour. How to read music for piano? Have you ever found yourself amazed by the beauty and the precision with which pianists fly through the pages of notes? Have you ever thought how you would also like to be able to produce those eternal sounds that make life sound magical? But then one day you find yourself staring at those music sheets where you struggle to understand a single thing, where all the lines and signs are so confusing that everything becomes frustrating and complicated to the extent that you decide to forget about your ‘pianist career’. Here we will help you persist on your way to creating your first masterpiece. So… Do-Re-Mi-Fa-Sol-La-Si-Do…. A-B-C-D-E-F-G….. The Treble Clef – Right Hand – Higher pitch notes 5 lines & 4 spaces, each of the lines and spaces has a specific note that is located up there! The Bass Clef – Left Hand – Lower Pitch Notes 5 lines & 4 spaces, each of the lines and spaces has a specific note that is located down there! First look at the treble clef! The treble clef is actually G clef! Then look at the bass clef! The bass clef is actually F clef! Do your best to memorize them! Label each finger with 1-5 starting with a thumb, for both right and left hand. Start on middle C of the piano, put both thumbs on the note and align them so that your right pinky ends on 5 (G) and your left pinky lands on 5 (F). At first, you only use white notes on a piano. As you learn, play and sing the letters or numbers, which will help you memorize the notes. Ledger lines are lines for notes that occur outside of the normal range for the Grand Staff (Stave). They are in both the Treble or Bass Clefs, but you won’t see them unless the piece requires you to play the notes that are above or below the Grand Staff. The most common note that is on the ledger line is Middle C.
How to really play the piano or getting familiar with key notes? The black keys are used to play what is known as sharp (#) and flat (b) notes and appear in the groups of twos or threes. The key to the immediate set of any two black keys is a C.
The note head, stem & flag taken together show the musician the time value for any given note as measured in beats or fractions of beats. When you tap your foot in time to the music, you ‘re recognizing that beat. If you find yourself tapping 1-2-3-4 along a piece of music on the radio, you’re subconsciously finding the measure lines already. It’s the ‘pulse’ or the meter, and it varies from 4/4 or common time where each quarter note is common to one beat. That’s the situation in most popular songs. If we change the numerator we change the number of beats in a measure. Whole note – four beats, half note – two beats, quarter note – one beat…. Get in the groove! Rhythm is an essential part to the music. So… feel it! If you tap your fingers to your desk on 1 and 3 tap louder and on 2 and 4 taps softer and reverse it…. you are in the game. Then you need to take a rest after a while, whole rest, half rest, ¼ rest, 1/8 rest. Once you’ve seen and practiced all those different aspects of playing the piano, you have to gather them all together, connect the notes, the rhythm, the timing and measures, so you can finally get an idea of not only how it looks but also how the music you produce sounds. Yes, let yourself go to the melody and rhythm you bring to life. How to play your first song? As you have already realized, it’s never too early or too late to start playing the piano. Don’t fool yourself that you’ll become the next Beethoven or Mozart overnight, so it’s always safer to start with beginner songs, that might sound uninteresting but can help you gain some self-esteem and then continue enthusiastically. Whether you decide to stick to classical music and start with some easier compositions like Mozart’s ‘A little Night Music’ or you desperately need to enjoy in your own performance of one of your favorite songs, just go ahead and give it a try.